The 1998 Italian Grand Prix was the 14th race of the 1998 Formula One Season. Held at Autodromo Nazionale Monza on September 13 1998 in sunny conditions, it was won by Michael Schumacher for Ferrari. His teammate Eddie Irvine finished second, giving Ferrari a 1-2 finish on home soil to the delight of the tifosi. It was also the last win for Goodyear in Formula One. 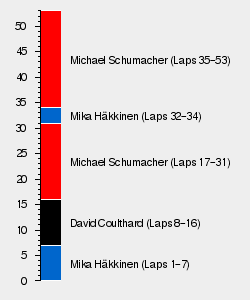 Schumacher's win put him on level in points with Mika Häkkinen in the Drivers' Championship with two races remaining. Last F1 win for tyre supplier Goodyear.